Verdict: It’s now free, amazingly, and you can download the Google Nik Collection here. But is it any good? Mostly, yes. Dfine and Sharpener Pro look weak and dated and Viveza is a bit of a one-trick pony, but Analog Efex Pro, Silver Efex Pro, Color Efex Pro and HDR Efex Pro and excellent and easily carry the whole suite on their own. This is a 5-star package, and no mistake. The Google Nik Collection contains some of the most important and best-loved plug-ins in the world of image-editing. Until recently, you bought them as a suite, direct from Google, for £95 (around $150), but Google then stunned the creative community by making them completely free. Analog Efex Pro 2: This is the only plug-in produced by the Google team – all the rest were inherited from Nik Software when Google bought that company out. Analog Efex 2 is designed to replicate the look of old films and darkroom techniques by adding grain, fade, borders, like leaks, toning, cross processing effects and more. Color Efex Pro 4: On the surface, this looks like little more than a large collection of filter effects, some more useful than others. In fact, each one can be customised and controlled and they can be ‘stacked’ and saved as ‘recipes’. Color Efex Pro 4 is an effect generator and image editor in its own right. Dfine 2: This is a noise reduction tool which analyses the noise properties of the image and then applies noise reduction in a two-step process – you can use automatic or manual noise analysis and you can use the default noise reduction settings or adjust contrast and colour noise manually. HDR Efex Pro 2: HDR Efex Pro 2 uses tone mapping tools and a variety of HDR algorithms on either single images or HDR exposure series, which it can merge with automatic alignment, ghost reduction and chromatic aberration removal. Sharpener Pro 3: Like Dfine 2, Sharpener Pro 3 is an image enhancement plug-in rather than an effects tool. It takes a scientific approach to sharpening that will appeal to purists, separating capture sharpening (overcoming camera/lens softness) from output sharpening (preparing images for different print/display devices). Silver Efex Pro 2: A powerful black and white conversion tool that simulates the appearance of classic film emulsions and darkroom printing techniques. It offers a range of preset effects backed up by powerful and extensive manual adjustment tools. Viveza 2: Viveza offers the equivalent of dodging and burning in black and white, but for colour photos. It uses Nik Software’s control point technology to both mask and adjust areas of the image in a single operation. There’s a mixture of tools here, and some overlap in functions (Analog Efex Pro, Color Efex Pro and Silver Efex Pro can all do retro black and white, for example) and a rather curious upgrade method. Google maintains that this happens automatically in the background while the software and its host apps are inactive. If you’re not convinced, you can simply download and install the collection all over again to make sure you’ve got the most up to date version. So that’s the overview, now what about the individual plug-ins? I downloaded the Nik Collection several months ago and have use as a stand alone product (Silver Efex Pro and Color Efex Pro) not as a plugin. What are the downsides to this? Image quality? Read a couple times online that you can use as stand alone but no detail beyond this as to advantages / disadvantages. Photography a hobby for me since 2005 using Canon / Olympus products. My enjoyment / challenge comes from playing with the camera in the field but can’t say the same for post processing (1 of the 2 reasons why I haven’t invested in Lightroom or any other editing program). I fine post processing does help and generally my adjustments are minor ….for exposure, contrast, etc. I shoot RAW and use Canons DPP and GIMP / Nik collection for the Olympus micro 4/3. Lately using the snapseed app for ipad and enjoy this product very much. So what am I missing out on by using the Nik Collection as a stand alone? Came across your site a few days ago and very informative. My interest is in macro / close up, black & white photography (starting to read up on this), some landscape and down the road i want to try long exposure photography. The Nik Collection tools do seem to work fine as standalone programs. I find it easier to launch them from a ‘host’ app like Lightroom, but I don’t think it’s essential. Like many others since I updated to Photoshop CC 2018 my Nik software crashes after trying to apply the effect. I saw one post stating that the fix will be mid 2018??? I have been using Nik since it came out and use it professionally. I really can’t wait that long. Any help??? 1. What is the version number of the currently available HDR Efex Pro available for free download from Google? 2. How do you set up the NIK software as a Standalone application? Now they are Photoshop plugins. 3. MY PSCS6 works OK except when I use NIK so I think it is problem with a corrupted NIK application. What do you think? Any guidance and information is appreciated. Thanks for your help. The current version of HDR Efex Pro is 2.2.24, so it sounds as if the version you have is relatively recent. The Nik Collection had an auto-update feature, so it’s possible your version was upgraded without you being aware of it and has become incompatible with your system. That’s only a guess. 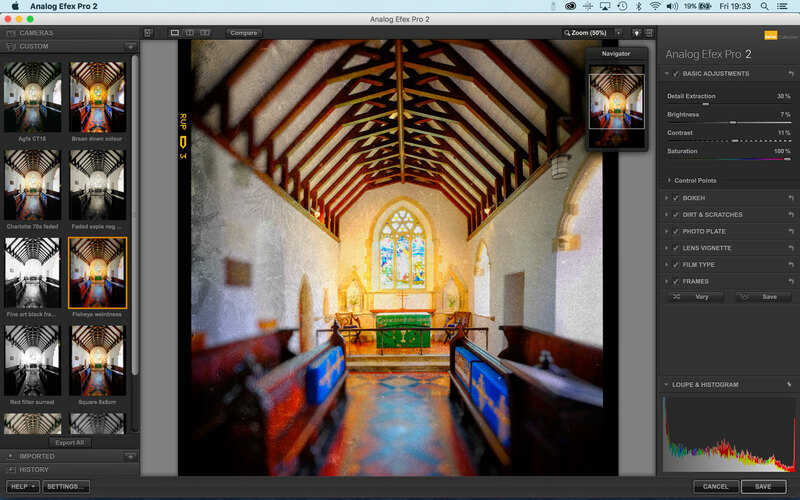 Have you tried simply double-clicking the HDR Efex Pro app icon? It will run as a standalone app on my system, but if it doesn’t work on yours it could be another sign that your version is too new for OS X10.7.5. Unfortunately, I don’t know how to roll back Nik Collection plug-ins to an earlier version, sorry. Thanks for your prompt reply. I did some more digging around and followed up your suggestion to see if clicking on the NIK HDR icon will work. When I originally installed NIK it was as a plugin to Photoshop. Now the plugin does not work. But if I convert the RAW files to tiff then the Standalone works! The Standalone does not work with RAW files. I think the reason my version is 2.2.20 and not 2.2.24 is because my OS X is 10.6.8 and not 10.7.5 so it appears that Google did not update my software to an incompatible OS. Photographs do not lie , unless they are retouched. Previous Previous post: The Google Nik Collection is now available free of charge!